While many are concerned about the potential for misuse and abuse that comes with the utilization of opioid analgesics, an additional challenge is the side effects opioid analgesics can cause. You may have met Anne, a 45-year-old woman who injured her back at work. Helios shared her story in July to demonstrate how opioid analgesics have the potential to affect every major body system. Over the course of Anne’s claim, there were several missed opportunities for more proactive medication management. Consequently, she developed a dependence on her medications, experienced urinary and constipation difficulties, and was at an increased risk for respiratory and cardiovascular complications. These side effects lengthened the duration of her claim and added significant financial costs. More significantly, the side effects were disruptive to Anne’s ability to lead a productive and active life. Her overall ability to function diminished, as did her outlook. Unfortunately, Anne is not unique. Meet Tom, a 49-year old truck driver who injured his back at work when he tripped and fell over a lift-gate. Multiple treatment modalities were tried, including non-pharmacologic therapies, such as physical and aquatic therapy and a spinal cord stimulator. 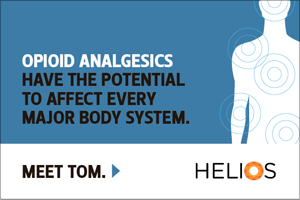 Over the course of his claim, Tom was prescribed non-steroidal anti-inflammatories (NSAIDs), muscle relaxants, anticonvulsants, antidepressants for neuropathic pain, and opioid analgesics. While his doctors used a variety of medication management tools, including a signed medication agreement (also known as a pain contract), regular pill counts, and urine drug testing to promote safe and effective use of opioid analgesics, Tom suffered adverse side effects. He experienced depression, insomnia, constipation, and erectile dysfunction. His case shows how sometimes even with more proactive management, very complex situations develop. Additionally, Tom’s case highlights how opioids affect men and women differently. Not only did Tom suffer from erectile dysfunction, but also an under-recognized condition known as opioid-induced androgen deficiency (OPIAD). Click here to learn more about Tom’s story. While opioid analgesics have an important place in medication therapy for the treatment of pain, careful consideration of the risks and benefits associated with their use must occur. By teaming with a pharmacy benefit manager such as Helios, payers are better positioned to proactively identify the medication complications that Tom and Anne experienced, as well as take action to mitigate situations of misuse and abuse. Through this collaboration, better outcomes are achieved, clinically as well as financially. For more information on how Helios can help your business shine, visit HeliosComp.com. This is a sponsored post from WorkCompWire marketing partner Helios.